I was not an easy child. I was afraid of thunderstorms, and of the vacuum cleaner. My head was so big that I would wind up in tears when my mother tried to wedge it through a turtleneck. I was terrified of needles, so much so that nurses had to sit on me to give me my booster shots. Even sweet, wrinkly E.T. scared the crap out of me, with his weird misshapen head and creepy glowing finger. And on top of all that, I hated bananas. Kids are supposed to love bananas — when all else fails, that, at least, is supposed to be easy. My poor, patient mother did her best. To ease her mind, she once consulted a psychic, who told her that I was a “new soul,” that this was my first time on Earth, so quite naturally I was scared — of nearly everything. This didn’t explain the turtleneck problem, but still, it was something. Bless you, Mom. But anyway, new soul, old schmoul: if little seven-year-old me could see what is in my freezer right now, she would shriek in horror. Lurking within its icy depths are no fewer than six ripe bananas: hard, frosty-skinned, dull brown boomerangs, a veritable stockpile of tropical fruit terror. And what’s more, I love them. Growing up is really a great thing. I’m not exactly sure of the chain of events that led to my conversion, but I’m quite certain that it started sometime in my pre-teens, with a banana nut bread made by the mother of my childhood friend Jennifer. Linda is a genius at quick breads, not to mention Christmastime sweet rolls and chocolate cream pies — this last being best, I find, if eaten straight from the fridge when your babysitter isn’t looking. Such is Linda’s talent that not even I, Scaredy-Cat Supreme, could resist her banana nut bread. It is persuasive, soulful stuff, and should be fed to all children in need of calming. So today, even though I am still not a big fan of bananas straight up, ooh boy, do I find it easy to tuck away baked goods made from them. Sometimes — don’t tell anyone — I buy bananas for no real reason at all, just to bring them home and let them go brown on the countertop. I can’t help myself. There is something profoundly reassuring about having a bunch of them at the ready, ripe and speckled and almost stinky. It’s like hoarding gold bullion — but the kind that needs to be stashed in the freezer, lest it start to rot. Never mind that I have to stifle my gag reflex every time I open a defrosted one and watch its slug-like contents ooze out; by god, I love baking with bananas. They make baked goods miraculously moist and tender, with a sweet, wholesome fragrance that, I like to imagine, Betty Crocker herself might have worn. Lately, I’ve been dumping banana purée into anything that will hold still long enough to let me, from this unusual cake — which, like many sweets, tastes even better frozen — to an old favorite banana bread with chocolate chips and ginger. I find that a girl really cannot have too much banana cake with chocolate ganache, nor can her man eat too many bran muffins scented with the stuff. So great is my love for this once-loathed fruit that last weekend — despite several consecutive weeks of the above sweets — I felt compelled to bake up this delicious beauty. Humble, homey, and crowned with a fallen halo of coconut cream cheese frosting, this baby is a keeper. Its crumb is light and rustic, more coarse than fine, making for a good, unfussy foundation on which to spread a generous layer of frosting — tangy, fluffy, and barely sweet. With a subtle banana flavor and a soft, tender chew, it’s the sort of thing that begs to be cut into big slices, and then later into sneaky, stolen slivers. If you’re anything like me, you’ll also follow that up with a careful licking of the fork — and, ahem, knife. I would dare to venture that even seven-year-old me would have found it sort of tasty — maybe even frighteningly so. This cake is a cinch to make — perfect for a weeknight dinner with friends or a lazy weekend treat. The original recipe calls for bananas that are “well mashed,” but I almost always prefer to purée mine. A little zizz in the blender or food processor makes them smooth, airy, and blissfully free of lumps, and that, in my opinion, makes for a better, more consistent crumb. For this recipe, I found that about 2 medium very ripe bananas yielded ¾ cup purée. Place a rack in the middle of the oven, and preheat the oven to 350 degrees Fahrenheit. Lightly butter or spray a 9-inch round cake pan (I used a springform pan), and dust it with flour, shaking out any excess. Spread the batter in the prepared cake pan, and bake until the top is pale golden and a toothpick inserted in the center comes out clean, about 20-27 minutes. While the cake cools, make the frosting. In a medium bowl, beat together the cream cheese and the butter on medium speed until smooth. Reduce the speed to low; then add the confectioners sugar, cream of coconut, and rum. Mix until combined; then increase the speed to high and beat until light and fluffy, about two minutes. since you’re adding the coconut cream cheese frosting already, throw in a cup of grated carrots for an extra moist banana-carrot cake! it’s yummy! one of my best sellers is my choco-banana cake with a cup of melted chocolate swirled in just before baking! I don’t know if I would have liked bananas as a kid or not, as we didn’t get them behind the Iron Curtain. I must have been in my late teens before I ate one:)Lovely cake recipe! Ooh! Heavenly! And less work than a carrot-cream cheese-coconut-concoction…I think I might try these out as cupcakes. I’m a big fan of bananas and like them best on top of crackly peanut butter toast. The combination is amazing! And this recipe, as well as all of the other banana-y sweets you’ve mentioned, sound unreal. I also love the coconut and cream cheese combo. YUM. A banana cake was the first cake I made from scratch, for my 1st wedding anniversary, and it came out so wonderfully well that I was emboldened to go on to a couple decades more scratch baking. At the time, I just thought I was very clever, but now I think that bananas are a very forgiving and powerful ingredient, so I have them to thank for the confidence boost. I like that about the new soul. I´ll have to tell my sister, she´s a real new soul. I´m your opposite, love natural bananas but am not so crazy about the cooked stuff. Coconut frosting sounds great, though. Molly!I love reading your blog. I found myself absolutely giggling throughout. I have a son who quivers in disgust at the sight of bananas—and I am the proud owner of a banana-induced gag reflex. But I tell you what, I pop a bag of mini chocolate chip banana muffins in their lunch and they disappear every time! Keep coming with those great recipes! mmmmmmmmm that looks so good!As a child, I was petrified of ET. After my parents took me to see the movie, I slept on my brother’s floor for 6 months, I was too scared to sleep in my own bed. I was one of those kids with hundreds of stuffed animals in my room, so THAT certainly didn’t help. For years after, I’d often wake from a recurring nightmare in which ET was eating my pancakes. I’m glad you were converted to bananas so that you could make this scrumptious creation! Ha!!! I too was scared of E.T.!!! PETRIFIED in fact! And I hated bananas. I have since converted and this recipe sounds great. I have 2 ripe bananas at home, I think I might have to indulge and make this! If it makes you feel any better, my banana confession is even more self-indicting. You see, I love the brown, spotty overripe banana and it horrifies everyone around me, so I eat them privately. Quietly. Only the lady at the bodega where I get my morning yogurt knows I bypass all the bright yellow healthy ones for the unlovable, about-to-be tossed one in the corner. And my husband, who would much rather me bake them into this cake. Understandably, too – it looks lovely! That looks great! I’ve made the original two-layer recipe (from Gourmet) several times and its just delicious. Unfortunately my honey is allergic to bananas, so I’ve slowed down on my banana cake baking. But all of these suggestions to throw in some chocolate chips might make me bake a batch all for myself! your poor mother… collette could quite possibly consume four or five bananas if we let her. we dont. this cake looks heavenly and i think i might just make it, even though i just polished off a batch of pumpkin spice muffins with cream cheese frosting. How funny! I do the exact same thing; buy bananas strictly to watch them go brown. Almost rotten and sticky, brown, bananas really do make the best bread.Thanks for the story. It made me laugh. Although I haven’t been reading your site from the start I do have to say that your photography has gotten better and better with each post. It was the intro photo of the banana cake that really sealed it for me; very nice.Yes, the comment is off-topic but I thought it was worth a mention from someone who tries hard at food photography himself. Great job! Great post! I love the story and the recipe looks great, but I’m also a banana fan from way back. I’m going to try this recipe. It looks really simple – quietly elegant, but delicious! That looks so good!! I can’t wait to try it. I love changing tastes as we get older–I now eat radishes and beets and strawberries (I can’t believe that I was so disgusted by seeds as a child that I couldn’t eat yummy yummy strawberries). Also–I made the apricot-chocolate cookies from the Oklahoma post and they were a huge hit with my class! I added extra espresso and I’m sure I could have added more, and I used dark chocolate chunks that I chunked with a knife so there were big pieces and teeny slivers. Oh, I wish there were leftovers! Molly,Oh to write like you do! Quite a talent you have. My efforts would go something like this… “I made beef and pepper burritos for dinner. They were good. I ate too much.”Anywho, I’ve got some bananas in the freezer and cream cheese in the fridge, I believe I’ve found tomorrow night’s project! Molly, you’ve grown up more than I have! However, I’m just grown up enough to enjoy bananas baked into things and your cake with (oh my!) 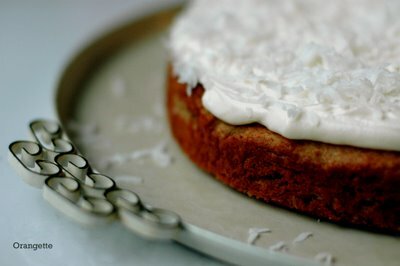 coconut cream cheese icing sounds truely spectacular. I think I’ve found Cornelius’ next birthday cake. I have enjoyed reading your blog for several months now. You have a way with words and are a wonder with photos. I could not help but laugh, I have always been a “banana hater” but now also buy fresh, yellow bananas only to use once browned and ripened. Just this morning I made banana-cinnamon waffles. Living in Peru has also forced me to explore the MANY varieties of “platanos” and I love them boiled, fried, grilled as well as baked in my cakes and breads! Thanks for the constant reminder to be passionate about food! I’m exactly the opposite–loved bananas as a little one, and now I can’t stand them. Lovely photography; the recipe sounds good…if it didn’t have bananas in it. Oh how I long for a banana. At the moment (due to storms in the North that destroyed this years banana crop), they are few and far between in Australia. They have become a luxury item- I bought a single banana last week for $3.50. The minute that bananas fall below $11 a kilo I’ll be making this cake. Oh my dear, I am laughing so hard at the image of you, with your over-large head, crying at the attempt to pull a turtleneck over it. Priceless. That’s one of those lines I love. My Mrs. Beasly doll scared the crap out of me. I’m not kidding. My parents had to march it right back to the store. Even though I cannot eat your banana cake (damned gluten! ), I will enjoy it via photograph. As always. That reminds me a lot of how I was as a child. I couldn’t watch E.T. or the Little Mermaid because of those creepy creatures in them. I wasn’t opposed to bananas, but there were plenty of other foods I wouldn’t eat. I’ve got some bananas in the freezer right now and I’ve been wondering what to do with them. Maybe I’ll try one of your delicious recipes! In a sick way, I’m almost glad you’re posting just once a week…otherwise I would weigh thrice my natural weight! Delcious post, Molly. 🙂 Thanks again! I can’t help but be amused with your story. I love your recipes. Unlike you, I’ve been craving for bananas since I was a kid. Tried the cake and it worked out well! The icing is a no-go this time around- Dad loves coconut but Mom… not so much. I just made this cake for my co-workers and everyone just loved it. I was a bit scared because the batter was so thick but it turned out to be super moist and delish!Thanks so much! Oooh, good idea, Kayenne! I do love carrot cake, and you know how I feel about banana cake – but I’ve never tried combining them. I’ll have to give it a go. And as for you, that choco-banana cake sounds <>amazing<>.Ah ha, Pille, so you were spared the scourge of bananas as a kid! You lucky thing. I do imagine, though, that that first taste in your teens must have been pretty magnificent. There really is nothing else – fruit or otherwise – with that familiar but exotic flavor…Janice, this cake recipe would make terrific cupcakes, I think. In fact, Brandon even mentioned something to that effect while he was eating one of his many slices.Oh, but wheresmymind, the nearly rotten bananas are the best ones! You know, for baking, at least.Lia, I hear you – one of the few ways that I find myself eating an unbaked banana is sliced and laid atop a piece of toast with peanut butter. Oh MAN. So good.Oh Lucette, I love the thought of you baking a banana cake for your first wedding anniversary. What a sweet memory! [No pun intended, I swear.] I might have to do that myself, in a year and nine months or so. So sweet.Lobstersquad, you know, it’s funny – both my mom and I now think that the psychic was wrong about the new soul thing. I do have some funny proclivities and tendencies, yes, but — not to go all new-age on everybody — I feel pretty strongly that this isn’t my first time around. Nonetheless, the idea of me being a new soul gave my mom some solace when I was being a weird little kid, so it did serve its purpose…Thank you, Janelle! It sounds as though you, your son, and I have quite a few things in common — from bad to good, and gag reflexes to banana baked goods with chocolate! Too funny.Jennifer, how funny that your mom’s name is Linda! Are you sure that you didn’t grow up on Brighton Road in Oklahoma City? Positive? Although, hmm, I think that “my” Jennifer was pretty keen on her mom’s banana bread…Shari, get thee to the grocery store! This really is one of the simplest, most satisfying cakes I’ve made in recent memory. And the frosting is really lovely – it fluffs up so prettily on the beaters. I think you and T would approve. xoJenna, you’re killing me! <>Six months<> on your brother’s floor? A recurring nightmare about E.T. eating your pancakes? That’s it – <>you<>, my dear, win the Scaredy-Cat Award.Me too, Brilynn! Thank you.Katie, what is it with E.T.? I’m sure there were a lot of kids who loved him, but seriously, Steven Spielberg, are you reading? That was scary stuff! Waaah.Deb, you are a bad, bad woman. Eating spotty, almost rotten bananas – in <>secret<>?! Sheesh. All I can say is I’m very glad that you have that lady at the bodega to give you your fix, because you had better not come NEAR my stash.Oh no, Christianne – he’s allergic to bananas? That’s <>terrible<>. For sanity’s sake, yes, you should most definitely bake up a batch of something banana-y all for yourself, with chocolate chips, of course.Hannah, I know – I really owe my mom a big one. She is next in line for sainthood, I think. And I dare say that you, with all your cupcakes – and <>three<> kids – are too, don’t you think?GoodbyeCityLife, you’re a snorter too? The other day I snorted right in Brandon’s ear, entirely accidentally – and when he was trying to be cuddly, too! Yikes. I suppose one mortified boyfriend is better than your office full of stares, but oh my. Cuisineazine, you’re welcome. And as for your banana strategy, right on!Nikki, you’re speaking my language, lady. And oh <>yes<> – a smoothie just isn’t right without a banana. Agreed.Leslie, how funny! I’d love to see your banana bread recipe – I make mine with yogurt too. Oh, and I’m <>so<> glad to hear that the arugula salad hit the spot! Génial! That’s so nice of you to say, Robotic Gourmand. I bought a new camera earlier this summer – a Nikon D70s, a long-anticipated purchase – and although I am VERY much still learning how to use the bloomin’ thing, I just love it. And I’m so glad that it shows!Thank you, Anali! You put it so well – quietly elegant but delicious, yes!I hear you, Boring – isn’t it wonderful to grow up and find that, all of a sudden, everything tastes different? I used to hate asparagus and mushrooms, and I was very pernickety about cheese. Now? Please pass the roasted asparagus, mushroom anything, and cheese platter! Oh, and I’m <>so<> glad to know that the chocolate-apricot cookies were a hit. And with chocolate chunks too – yum. Garbo, you’re so sweet! I have loved to write since I was a little, little girl, and I was lucky enough to have some great teachers along the way who really encouraged me. It ain’t easy sometimes, but I still love it.Kickpleat, this would be a <>great<> birthday cake! Absolutely. And while you’re here, I have to thank you for your “Willie Nelson / UBC Cake” recipe – I’ve made it at least three times now, and Brandon and I both love it. With no butter or oil, it has an almost healthy feel to it – except for all that sugar and chocolate, I guess. But never mind that. It’s so good frozen, shaved off in thick slices…Thank you so much for your kind words, Gretchen – and for stopping by and reading! Your banana-cinnamon waffles sound wonderful. Mmmm.Rhi, well, hmm, I guess you win some, and you lose some? My next cake recipe will have no bananas, I promise.Aw, thank you, Julia!Julie, this icing really is spectacular – airy and fluffy, not too sweet, not too cheesy, with just a hint of coconut. So, so good. Emily, I’m so sorry about your bananaless situation! That sounds terrible! I’m sending my best cheap-banana wishes your way.Shauna, ma cherie, I swear – have you ever noticed how big my head is? I mean, it somehow looks as though it’s in proportion to my body, but really, it’s as big as my dad’s was, and he was six or seven inches taller and <>many<> pounds heavier than me. I tell you, carrying this huge head around is exhausting sometimes. Plus, it <>thinks<> so much. Gah. But hey, about Mrs. Beasley: my mother named her first car after her! I’ll have to tell Mom your story… xoNatalia, I wonder how many of us were traumatized by E.T. as little kids? I feel a lawsuit or something coming on…You’re welcome, Catherine! I wish I could post more than once a week, but maybe it’s better this way, for all of our sakes.Thank you, Shelly!So glad that the cake was a success, Liz! And as for the frosting, maybe next time? I used to be anti-coconut myself, but I’ve come around – <>phew<>!You’re so very welcome, Penelope! And I should have mentioned that the batter was thick, because you’re right – it really is. It scared me too! I feel like an insider ’cause I knew what you were posting minutes before you did! Or minutes after.As always, you certainly know your way around a banana, madame. Maybe this appitude is fueled by your former loathing for the fruit. There’s a thin line between love and hate, right? i think i have found my birthday cake 🙂that frosting sounds absolutely d i v i n e! Hi Molly I love your banana story I have recently posted two banana stories recently. One post involved the fact that I actually had some in my house for the first time in about 6 months. Bananas in Australia have become this really expensive commodity after a cyclone wiped out the major crops in North Queensland. So the Government decided to protect the livelihoods of the banana growers and decreed that there would be no imports of bananas. Thus bananas went up to about $20 a kilo (or $10 a pound) or so, they have now evened out to about $6 a pound but are still not the staple they once were on everyone’s shopping list. I imagine there are children and babies who are going through banana withdrawl. Some bananas recently came into our possession from some kindly souls who took pity on us – the bananaless. My son insisted that he take a banana to school over several days so he could be the envy of his mates during lunch-time. And then another astonishing revelation – I made some banana bread – because I discovered that banana bread wasn’t misnamed banana cake or a muffin – it could actually be toasted! I love it. All hail the might banana I say! I have a stack of green tomatoes sitting on my counter. Do you know of a good green tomato pie recipe? I have heard of such of thing, but just can’t quite imagine it. I have to do something with them though since I assured my wife that they were too good to throw out. That is <>too<> funny. I was a huge fan of E.T., glowing finger and all, but was absolutely terrorized every time those muppet martians that went “yyyip yip yip” put in an appearance on Sesame Street. I was also deathly afraid of the Stay-Puft marshmallow man from Ghostbusters, which may explain my continuing aversion to the fluffy stuff. As for bananas, I’ve always loved them best where baking is involved (and cream cheese frosting, yum!). Gorgeous cake, my dear! I just realized a week after reading this post why I loved it so much. One of my favorite places for cake here in NY is Billy’s Bakery (which is located just a little too close to my office). They make a MEAN banana cake. A co-worker suggested getting it for someone’s wedding shower a few years ago and I specifically remember saying that not everyone likes banana and maybe we should get something else (mainly because it didn’t sound too good to me — I’m shameless, I know). She persisted and THANK GOD because it is one of the best cakes ever. Now I can enjoy a similar version at home with your recipe, but next time you’re in NY, you have to try it! I didn’t like bananas as a child, either. Bananas or <>hamburgers<> for pete’s sake!In college I graduated to very green bananas, and now I like them so long as there are no spots.I’ve got 4 spotty ones in the kitchen as we speak, and can’t wait to give this cake a go.Cheers! I tried out this recipe as < HREF="http://www.giantjeansparlor.net/archives/2006/10/baking_away_the.html" REL="nofollow">cupcakes<> with < HREF="http://www.deliciouscoma.com/archives/2006/10/kinako_frosting.html" REL="nofollow">kinako frosting<>. (Shredded coconut in Japan is expensive and sad-looking.) It was so yummy! I’ve started hoarding bananas in my tiny freezer…. i am STILL terrified of ET. i will never get over how his uber-creepy fingers had to go around corners before his icky head-on-a-stalk did….bananas are a poor bachelorette’s best friend, and i just got a huge bunch! yay for this recipe!but what the heck is cream of coconut? what could i sub if i can’t find it? Molly, my cake is in the oven as I type – fingers crossed it comes out as good as everyone elses’s. I was worried about how thick it was, so I came back to the posting and was so relieved to see the comments about this. Thanks for what promises to be another great recipe! Ooh soo good! I whipped this up last-minute for a dinner date, and what a treat! Great recipe! molly, i read you constantly, but rarely comment, resorting merely to saving unwanted brussel sprouts and other ‘ugly veg’… there’s a number of your cake recipes i’ve been meaning to make, and this is the first. it’s just come out of the oven and dear GOD is it heavenly- just a snaffled piece of crispy sweet crust was enough. thank you so much! I am only 2 years behind, right?since you mentioned perfume – try this. < HREF="http://www.sephora.com/browse/product.jhtml?id=P51100" REL="nofollow">vanilla banana perfume from comptoir sud pacifique<>I have been wearing it for a couple of years now and it smells lovely. not too banana-y, not too sweet, just sort of like you stepped out of a 1950s kitchen. mmm. Oh dear Lord, woman, look what you made me do! I used two <>black<> bananas to make this, didn’t even puree them, I just plopped them in the mixer. I loaded it up with chocolate ganache, since we don’t really <>do<> coconut in this household. It’s still warm and delicious, and once again, my hat’s off to you, of Banana Baked Good Goddess. There seems to be a problem with the amount of butter! 4oz is only 1/4 cup, while it should be (according to Gourmet) 1/2 a cup of butter!I mixed it up and it looked weird so I went looking for the original recipe. Thought I’d save anyone else from doing the same thing!This recipe is AWESOME and your photos are stunning! Thanks for sharing! Finally got around to this one; great stuff! Thanks for giving me something to do with my bananas once autumn inspired me to turn on the oven again. And my verification word is eaters, too cute. I just made this cake last night and it is fabulous. The icing is wonderfully fluffy and glossy. My only change was to toast the coconut before sprinkling it on top. This cake is an absolutely keeper! Hi! I'm a new reader who decided to read all your posts after I read your book. I love this recipe! I want to try it as cupcakes with peanut butter frosting. Yummy! I baked the cake part of this recipe for my birthday this weekend and it was sublime. I don't usually put icing on my cakes as I like them to stand alone (and this certainly could), but since it was my birthday I whipped up some chocolate frosting for this one. Heaven. Want to make a banana cake this week, but can't decide which one. I know I want to do a chocolate frosting, but what's the difference between the cake in this recipe and the one with the ganache glaze? Which one do you like better? Do you think the frosting could go without the coconut cream (it's not available where I live)? Should flaked coconut be enough?